For those of you who are fans of anime style films, you might find this movie interesting. Instead of being based in Japan, the movie is set in 1942 Russia. So it’s a war movie. The German Army has managed to raise an army of long dead warriors, who have an old score to settle with the Russians. But the Russians have a secret weapon the First Squad. 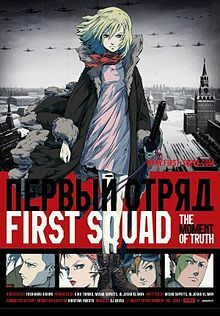 The First Squad is a group of youth with psychic abilities. The problem is that all but one of the members of the squad are killed. The only living member must travel to the world of dead warriors to ask the other members for assistance. The movie is based on a comic book series from the Soviet era. So it definitely has a propaganda feel to it, but the story is interesting. It’s kind of captures what people might have been hoping for during that war. I’m sure that there were individuals who were hoping that some miracle would happen so that the war would be shortened. The animation is also great! The scenes on the battlefield are almost lifelike in a cartoon way. They are bloody. So this isn’t for children. But if you are looking for an interesting story that has a much different look than traditional Hollywood films, you might enjoy this movie. very interesting stuff. I know my nephew would love it. Thank you for sharing.